Attention chocolate lovers! These comments and graphics are designed specially for you! 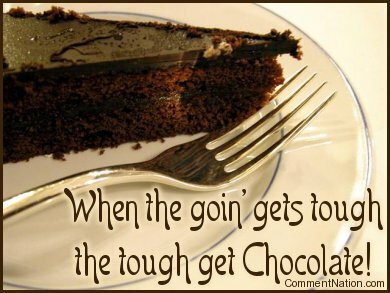 Whether you're a confessed chocoholic or just someone who enjoys an occasional jaunt on the "darker side" these chocolate jokes, comments and glitter graphics are sure to please! GIFs, animations, comments, memes, greetings and images free to use on Facebook, Twitter, Blogger, Wordpress, Tumblr, or any other webpage or blog. Always free for your personal use.